Market your Organization by including descriptions and images on your Marketplace Page. You can add a logo image, cover photo, and description for your Organization as well as for each team and program for sale in the Marketplace. Your Organization is somewhere athletes can learn about you, your staff, and your teams in the Marketplace. Next, update your description and images. To upload your images, click on the camera icon. This will allow you to upload an image file from your computer. The best sizes for the logo image is 500 x 500 Pixels and 500 x 1500 Pixels for the cover image. You'll want to spend some time creating a logo and banner image for your Organization. This stuff is more important than people give credit for. Seriously coach, a professional image WILL DRIVE SALES. Go to Teams and click the gear icon to open the Team's Settings. If you are setting up the Program's page, go to Library, select Programs, and click the gear icon next to the Program. Give the team or program some personality and swagger with a Logo and Cover Image. Next, select "Marketplace" from the Settings menu on the left and choose Yes when prompted if you want to sell access to this program in the Marketplace. Who specifically is your team for? And, who is it NOT for? What goals are being targeted and what should athletes expect? How long is the average training session? What equipment is generally required? Why is your community + team culture unique? Check out this GOOD example of a description page. Notice how detailed NorCal’s description is. Next, set your pricing. The annual price for programs sold to coaches must be at least $30. Athletes must be at least $15. We recommend pricing your programs at $1-2 per workout. Note that Programs are a one-time purchase, and coaches/athletes will receive access to the program for an entire year. Teams are purchased as a monthly/annual subscription. 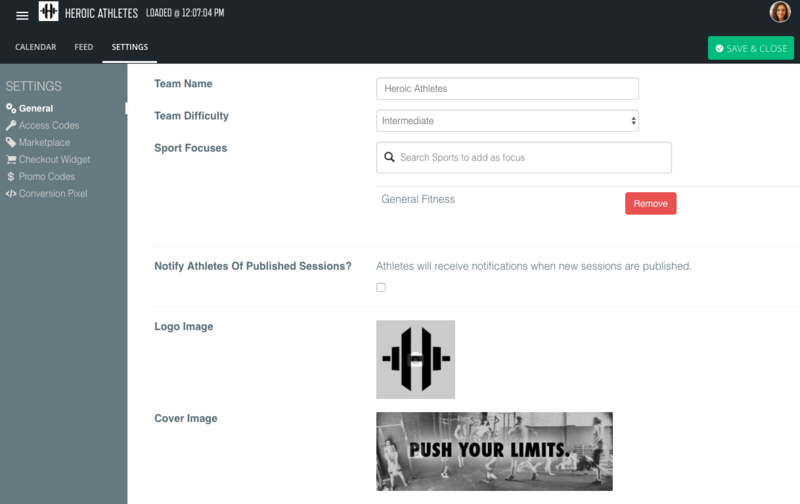 When a Coach/athlete purchases a subscription, their membership will auto-renew each month/year, giving them access to the programming as long as they are an active (paying) member. Set your Sample Week for the Team (Programs will automatically display Week 1 as the Sample Week). You can even include a video URL to SHOW what your programming is all about. We will generate a unique link to your team/program in the Marketplace. Use this for marketing purposes, or if you wish to leave your program unlisted and want to give it to specific clients only. You can preview your team/program's page by clicking on the team's link once you're ready to go. If you have any questions, comments, or feedback on selling program or anything else, please let us know by emailing the Customer Success Team at support@trainheroic.com.